It works fine , that’s all. I have to set the volume control high enough to the middle to hear it properly. I use it with a pair of 685B&W. For me the set is ok, my audition room is big and it works fine. Constructoon is bad. The on/off button sometimes doesn’t work, in fact very often. The lack of power. The lack of presence. The bad quality of construction. Simple to use, simple to hook everything up, no fancy stuff.. I didn't like the sound. i don't consider this an audiophile grade. A 7 times more expensive mcinstosh is probably 10 times better. I had also noticed very poor quality parts.. caps leak and blow up in no time. you will need to upgrade the parts but there are so many caps that it won't worth it. Also parts are exclusive so you can not buy them. Any cambridge products must be sent to an authorized service center.. So unless you have access to compatible parts you can't repair cambridge at home. Low resale value. this unit used to cost 600-700, as of 2018 you can find it around 100 on ebay... Mine lose its signal on the left channel from time to time.. regardless of the wires and speakers im using. I have a consumer grade Yamaha receiver and a Sony that both have a better sounding than this thing. Stay away from cambridge unless you like buying hidden low grade china parts. Purchased new with CD player listened to the amplifier for over a week then packed it back up in the original carton's..where they remain...! I suspect people who play with audio gear have a reasonable sense of power rating's. 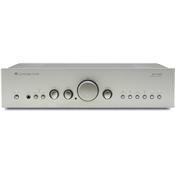 The amplifier rating is deceitful and has created the problem with the unit and user's, who know there not..! getting the rated power when dialing the volume at 12 o'clock....! Once you understand.... the amplifier is really only 32.5 watts per channel..! you become more satisfied with the performance and tend not push the Cambridge at the threshold of a protection trip...! Had this amp for years. Had the cutout problems. But this was due to not running quality speakers. Not enough sensitivity in my opinion. So heat built up in the amp. Now running a set of tannoys, speakers cost circa £1000, no problems at all. Thumping clear bass. Very clear through out the spectrum. Have not had any heat issues. Truly a pleasure to listen to the setup. This review is based on pairing the amp with DB Dynamics Polaris 488F floorstanding loudspeakers and a Yamaha CDC-575 CD player. The 640A is a potential replacement for a NAD 712 integrated amp, so there will be many comparisons with the NAD. Musical styles included rock, funk and acoustic guitar with vocals. The 640A was purchased second hand, upon unboxing the first thing I checked was that the amp does not go into Protection Mode when the volume is cranked (a problem mentioned in a few reviews here). Phew! Now for the subjective comparison with the NAD. Keep in mind these observations are based on the DB Dynamics loudspeakers and my living area's (untreated) room acoustics. The 640A is significantly brighter in the vocals. There is also more punch to the mid-bass, the low frequency range doesn't go as deep as the NAD. The observations about bass were confirmed by some measurements of playing pink noise through the system. The 640A dropped more than 8dB at 25 Hz (compared to 32 Hz), while the NAD only dropped 2dB. The measurements were less conclusive regarding the bright vocals- I was expecting to see more response around 2kHz for the 640A, but this was not the case. However, there was a 4dB dip for the 640A from 800-1600 Hz, perhaps this makes the vocals sound brighter than the NAD (which was pretty flat from 800 to 4k). Stereo imaging is less clear on the 640A. Extremes of left and right are well defined, but the centred sounds seem to be smeared between the speakers without any definite location. Although the NAD is the "winner" here, of course it depends on the rest of the system. I suspect that my speakers are quite bright, therefore the darker sound of the NAD works well to "tame" them. The brighter 640A took things too far in this case. But with different speakers, the brightness of the 640A could be an asset. For the price they're available for second-hand these days, it's a good amp. I don’t even remember when I both mine together with Azure CD. Never managed to push it up over the half. Protection kicks in and sound is OFF. If you have a party assume you will be kneeling trying to unplug and plug the amp while holding the power button. So if you need excuse to say Sorry for looking under you skirt but I was only trying to bring the music back on, this amp is for you . For me I am tired of unplugging and plugging it back on. The problem got worse I can not even go above say 1/3 and it will shut off for no reason. I thought this protection is good it will protect my amp. I did have to repair it once by replacing the . Power transistors at the certified repair shop which BTW did not look much better than any other store. They charged me arm and leg and amp is still doing the same protection cut off. If you think that is the only problem you are wrong. After a year remote stopped controlling the volume. One needs to get up press the remote and ‘help the value button a bit till it starts working again. Very fancy British design.. Pity I did not go for some consumer level cheapo piece of equipment. It would work today. Anything to declare? Yes, don’t buy it.. It is garbage. This amplifier is shockingly bad, when I bought it I did not like the sound, gave it a good break in, and nothing happened. I eventually lent it to my cousin, and got it back a few days ago. I clearly understand why I lent it, it is veiled to a great degree, no detail in the music, something is wrong with the volume as it starts clipping just over half power. I decided to open it up, and no wonder it is full of cheap chinese parts, cheap Xunda caps, the power supply is worthy of a phono stage, not an amplifier, it should be beefy and up to the requirements of a decently powered (on specs) amplifier, but it´s very substandard. It is dull, it sounds as if there was a curtain covering the speakers. I have a pair of sonus faber grand piano, which I run using a unison research s6 30W tube amp, and use an accupahse CD player, the combination is superb. When I connect the CA Azur, everything just degrades completely, admittedly it is a cheap amplifier, but it also sounds very cheap too. I have a very old Marantz SR-2385 which simply wipes the floor with the CA, there is no comparison whatsoever. It is much better to buy an old, higher quality amplifier than one of these cheap new amps. Do not buy, there are better options out there. I am very disappointed by CA, I also bought a 640P Phono Stage and it is equally bad. I will never buy CA equipment again. I have the Cambridge Audio 640A v2 75-watt amp, coupled with the 640C CD player and a pair of Monitor Audio GS10 speakers. When it works it sounds fine but it rarely works. There is a protection mechanism in the amp that turnsthe unit off when I have the volume above half (i.e. 12 o'clock). The clowns at the shop where I bought it have had it in for testing twice and declared it to be OK. Now they are trying to tell me that running the amp louder than half is pushing it too hard and the problem is all of my making. I would be interested in hearing if anyone else out there has had a similar experience with this brand of equipment. The short version: Good neutral sound with probably the worst build quality ever. I bought this unit back in 2005 together witj the 640C CD player and combined it with a pair of tannoy R2 speakers. The sound it produced is very neutral and laid back but involving at the same time. Later I replaced the Tannoy with the Audiovector K3 speakers and that was a perfect match. Clear, vivid sound. However it does lack a bit of commanding presence. The sound stage is a bit small and the depth too is a bit small. My current Marantz puts up a more realistic sound stage. Sound is well balanced with an ever so slight tendency to the higher tones and a bit lacking in bass punch. No other issues there. The only thing they should have done, is lower the output of the CD player or decrease the amplification of the amp. You cannot put the volume control pass the 9 o'clock position without playing too loud. A pair of attenuators took care of that problem. The biggest problem is its build quailty. The build quality of the unit (and also CD player) is very poor. The CD player failed after just 1 year. After having it repaired a couple of months later the control buttons on the unit failed. The amplifier damaged its left channel twice over the period I owned it. I never play loud (I live in an appartment) and the speakers a very amplifier friendly. Enough miseryfor me to not recommend this unit. Great sound. Poor build quality. The unit sounded great with my KEF speakers, very open and natural. Unfortunately, the left channel went bad at about 10 hours. After shutting off power for 10 minutes or so both channels came back but heavily distorted. The unit was returned to Audio Advisor. In all fairness, this was a "demo" unit but still should not have shut down and failed. Good from Audio Advisor in taking the unit back but I had to pay return shipping. Denon MosFet amplifier, Samsung CD player, KEF speakers, Yamaha A/V receiver.